Every year there is a segment of the population that simply charges their gifts on their credit cards and then spends the rest of the next year trying to get caught up on their payments. Before you do any Christmas shopping, you need to determine how much you can afford. From there, decide who to include and exclude from your list. To make it easy, try setting a per-person budget. For example, you'll buy $75 worth of gifts for each kid and $35 for each niece or nephew. 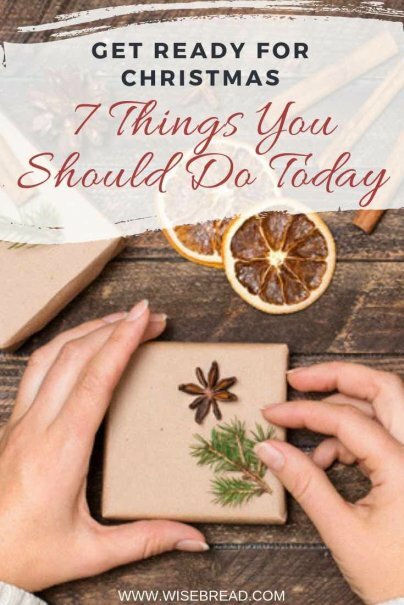 You're much less likely to overspend if you've predetermined how much you'll spend on each person on your list. Don't forget to check it twice. Homemade and personalized Christmas gifts are the most memorable gifts you can give. Why? Because the recipient knows that you've invested a significant amount of your time. I often think about doing homemade gifts, but realize I don't have the time to complete a project. By brainstorming homemade ideas now, you're more likely to have the time necessary to complete the project. My family does lists, and my wife's family does not. If you do ask people for Christmas lists, go ahead and contact them now. Inevitably, there is going to be one person who takes their time getting a list to you. That's less likely to be frustrating if you have an early start. If you don't subscribe to the Sunday paper, you might want to pick one up over the next few months. Set aside 10 minutes every Sunday to glance through the ads and coupons. If you find an item on your list, snag it while it's on sale. Otherwise, what's probably going to happen is that you'll run to the store on the 24th and pay too much on a gift you don't want to buy. Our personal goal is to have all our Christmas shopping done by the last day of November. That way we don't have to fight against the holiday crowds. Imagine how amazing it would feel if all your Christmas cards were ready to send by Thanksgiving — wouldn't that be a relief? Go ahead and set a target goal of when you'd like to finish all your cards. Then create some type of plan to be done by that date. You could either mark off a morning on your calendar or do a little bit at a time. There are a lot of great meals that you can freeze ahead of time so you have food available when the holiday season gets really busy. One way to fill the freezer is to double or triple some of your recipes you'll be preparing in the next month. Serve a single portion, and freeze the extra portion. Another option is to block out a full cooking day where you make as many meals as possible and freeze them for the busy holiday season. Most people I know spend their Christmas season busy doing things they didn't want to do in the first place. Start today by saying no to commitments you know will cause you stress over the holidays. If saying no is hard, then offer an alternative. I won't be able to ____, but it would work if I could ____ instead. With an early start, you can survive the hectic holiday rush. I'm sure that in December you won't regret any of the time you've spent while the pace of life is comparatively slower. Great advice -- it's all about planning and sticking to budgets. Ideally, planning for the holidays is, at least casually, a year-round thing. Great advice; from personal experience I've found that outlining a gift budget before doing any shopping is the best way to go. With all the promotions and holiday sales it's too easy to fall into the trap of spending too much on gifts that no one really needs. Outlining a budget and STICKING TO IT prevents needless holiday spending. I buy a lot of gift cards as gifts bc I have family spread all over the US. Earlier this year I discovered through SwagBucks.com a company called YouNeverLose.com. I get free points for the penny auction with every dollar I spend on gift cards i buy there. My family will get the cards this year, and I'll keep the cards I won with the free points. So far I've won over $300 in cards with my free points. Coolest site ever! Number 7 is probably the most vital point. We have a tendency to get caught up in wanting to give gifts and we end up giving many that lack quality, or end up getting into further debt. The best thing this holiday would be to make a commitment to yourself that you are going to save atleast 15% of your income and start investing for your retirement. Thinking and planning ahead of time really is the key to getting the best prices (and avoiding stress) on Christmas gifts. So far I've bought almost every one of my family members gifts online, got good deals, and don't have to worry about running around the days before Christmas or braving the zoo of a mall. I like your idea of preparing meals beforehand, I'll have to pass that along to my mom. I love making homemade gifts, it's so much more personal than going out to the store and buying something. People really appreciate the time and effort you put in. I always make big platters of little christmas puddings (covered in chocolate), chocolates molded in christmas themes & chocolate covered strawberries and deliver them to friends and family a few days before Christmas. It's perfect because people always have people dropping in around that time of the year and gives them something to offer others! I can't believe that Christmas is almost a month away. I love this time of the year and I am even going to get my Christmas tree a little bit early this year. Great post. I hope that everyone is getting the holiday cheer. Stocking up the freezer is such a great idea. I would prepare sauces and sides for Christmas dinner and just thaw them the day before. I like to plan for gift giving year round- christmas or otherwise. I set aside a SMALL percentage of each paycheck for giving (both gifts and charitable) and I make mental notes of what friends and family want and need throughout the year, then keep my eye out for a deal.